Whether you are starting a new collection or adding to your existing collection, you will love this nutcracker! He is an original and authentic Steinbach Star Wars Darth Vader nutcracker. Steinbach Nutcrackers are the most cherished nutcrackers in the world and are handed down generation after generation. The Steinbach family started making nutcrackers in 1832 by purchasing a timber yard and operating a wood sawmill, which ran initially by water power and then by steam power. "To produce one nutcracker," explains Herr Steinbach, "can involve up to 130 separate procedures. At one time, the curling and natural drying to the wood could take up to 3-4 years depending upon the piece." There are less expensive nutcrackers available than the limited edition one shown here. However, if I was choosing one and I could afford it, I would definitely want it to be a Steinbach nutcracker. 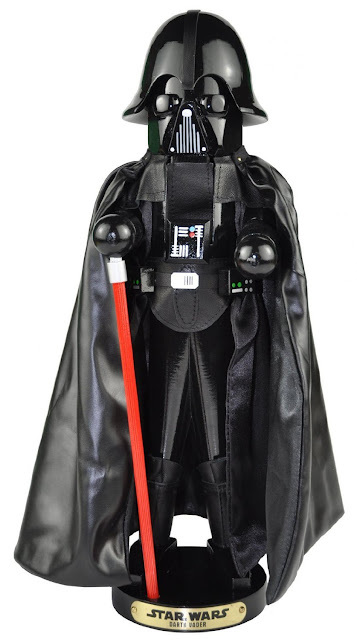 You can find your Darth Vader Limited Edition Herr Steinbach nutcracker on Amazon by clicking right here. Author's Note: This post originally posted on Squidoo in 2008.